Registration: For 2017, the Valkyrie is a little different beast than in the past. Due to travel, business, and the lack of organization with the Colorado Endurance Series (leadership is currently in transition with the series), the Valkyrie will be even less official than in years past. Self-serve: show up on January 21, ride the route as described via GPX file below, and keep track of your start and finish times. Email Velorution HQ with your times, if you care to have them published. Perhaps for 2018 we'll bring back the "unofficial-official" group start. Important Info: READ EVERYTHING BELOW! Results: See bottom of page. The Valkyrie is a backcountry, endurance fatbike race. The first and only fatbike race on the Colorado Endurance Series calendar, the Valkyrie is similar to other CES events in that it's grassroots, free, non-commercial, unsupported, and will be a heck of a good time. 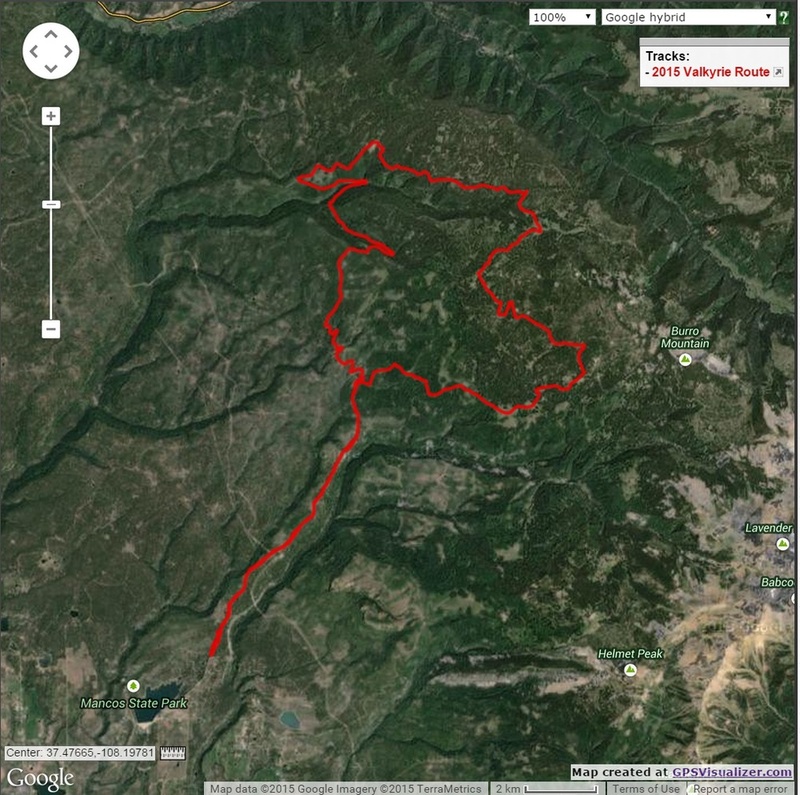 The Valkyrie course is in the West Mancos area; the route is ~35 miles with ~4700' of climbing. Don't let the small mileage figure fool you - we've had 20 miles take almost six hours to cover out there. After reading all this, you may wonder "Why even do the Valkyrie?" Well, it's beautiful out there; the course takes you places you'd never go unless you were on a snowmobile, dogsled, or skis; and, of course, there are lots of you that actually enjoy this sort of thing (you know who you are!). This list is on top of whatever normal gear you would bring for a long, self-supported adventure in the backcountry. Given average snow conditions in the West Mancos area, we expect the top finishers to complete the course in 4-6 hours. This event will probably take most people ~5-8 hours, and could take some riders 12 hours. The route is sometimes groomed and is frequented by snowmobilers, but "groomed" does not mean "like a nordic ski area". It's soft and slow in places. This is not a race for beginning fatbikers, or for people who only ride groomed trail. While the entire loop may be groomed (the San Juan Sledders occasionally groom the area) it could also be soft or fresh snow, and could require a fair amount of skill to stay on the bike. Walking is not out of the question! The Valkyrie is decidedly self-supported, similar in ethics to other CES events, the AZTR, CTR, and the like. There are no aid stations or resupply points along the route. You'll need to not only have all the food, drink, and clothing you might need for the ride, but also gear for taking care of yourself should you get caught out after dark or injured! We'll begin at the National Forest boundary gate on Montezuma County Road 42, about six miles north of Mancos, Colorado. Leaving the parking area - which sits at 8100' - we'll climb up towards Transfer Campground on CR42. This ~5 mile section is the "lollipop stem" of the route. At the fork of FS560/561, we'll take a right on 561, beginning the long, counter-clockwise loop portion of the course. At the next fork, take Spruce Mill Road (FS350) to the right. We'll pedal up through Beef Pasture, towards the La Platas, with great views all around. Back into the trees, more climbing brings us to a high, sloping meadow with another fork - we'll go left on 351. FS351 is the least-traveled portion of the route, and also the highest, and there may be a bit of hike-a-bike on this section! About a mile up, we'll top out at about 10,800', and there may be snowmobile tracks straight ahead AND to the left. The groomed base trail goes left, trending downhill, and this is the turn we take. Roll down a long descent (with a few short climbs) to rejoin 561, taking a right at the junction. Climb (yes, more climbing) to the north, checking out views of the Abajos and La Sals in Utah, along with the Wilson Group and Lone Cone. After circumnavigating a large drainage, take a left (downhill) on the road (556?) trending south along the rim of Lost Canyon. After a long, fast descent, we'll take a left on 560 and drop into the canyon itself, only to spend a while climbing back out. Then follow 560 all the way back to 561, completing the loop. Take a right at the final fork and pedal the "stem" all the way back down to the gate and the finish! 2016 RESULTS: We had another great turnout for the second annual Valkyrie, with 17 entrants and 14 starters. Travis Brown extended his winning ways into 2016, so far undefeated for the Valkyrie!